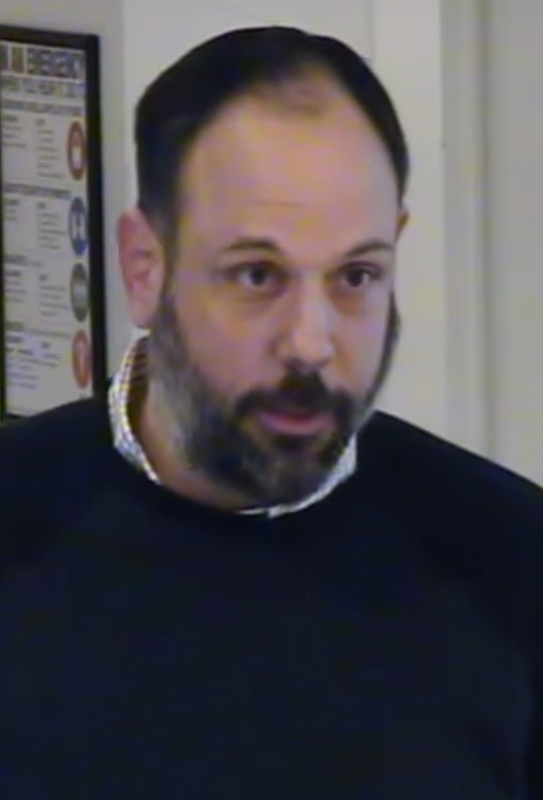 Norwalk Federation of Teachers (NFT) First Vice President Joe Giandurco, as shown in the Norwalk Public Schools’ video of Tuesday’s Board of Education meeting in City Hall. NORWALK, Conn. – The “very large and aggressive” 2019-20 Norwalk Public Schools operating budget request has “guinea pig items” that haven’t been thoroughly publicly vetted, a teachers union leader told Board of Education members at Tuesday’s meeting. Efforts to create a Montessori School, a School of Distinction and a rigor and relevance lab at Naramake Elementary School, as well as change high school start times, have not been publicly discussed, Joe Giandurco, Norwalk Federation of Teachers (NFT) First Vice President, said. The Board went on to delete the high school start time effort from its budget request, and unanimously approved the rest of the initiatives. Board Chairman Mike Barbis noted that the Board had devoted much time at one of its meetings to the Montessori idea, and the School of Distinction concept was discussed in December. Norwalk Superintendent of Schools Steven Adamowksi’s School of Distinction experiment would be funded by foundations in a three-year pilot program. The pilot school would seek to attain the state “distinction” designation with a school body of more than 63 percent high needs students as a research project that would add five days to the school year, lengthen the school day by an hour, and implement different teaching models. It’s part of an NPS objective to create a year-round school. Because the initiative would be funded by foundations, it’s not in the Board’s operating budget request, Giandurco observed. Barbis did not reply to a Monday email offering him a chance to comment further. Adamowski did not respond. NPS Communications Director Brenda Wilcox Williams wrote in a Monday email that the Montessori School initiative, School of Distinction, and the rigor and relevance lab at Naramake Elementary School were previously discussed publicly. Wilcox Williams noted that the Naramake School lab, known as the “Quad D” lab initiative, was discussed publicly at the Board retreat in July. “The Quad D concept was embraced by Naramake teachers and administrators, who have been recognized nationally for their leadership,” Wilcox Williams wrote. Truly a gem our Board Chairman is! If you don’t have teachers to teach then your budget won’t help you at all. Don’t you think you should talk and discuss with all parties that a have stake in it?? And just because you are voted in, you can do whatever you want? You my friend are the picture of entitlement! Glory be. Brings back the “good old days” when the Teachers Union had a de facto seat at the BOE table. And even campaigned against election of BOE candidates not considered favorable. Anyone remember the NFT monthly “Vanguard” that skewered occasionally BOE members/Administgrators. Norwalk has a long tradition of our teacher’s Union actively involved in BOE decisions. Under recent year’s the BOE has changed course. But with One Party City Governance for the foreseeable future who can complain if our NFT again seeks to become actively involved in running our public schools. If only our teachers would once again live in Norwalk ….Dream on. Lets encourage everyone to support the BOE. Not because they always make the best decisions. But because they represent our City and ought have our support as “public servants”. As distinct from the City Hall $150k “Chiefs”. nft needs a seat at the table,the boe thinks that they can rule everything and we will just keep on paying. wake up citizens. Point of clarification to the story- “The Board went on to delete the high school start time effort from its budget request, and unanimously approved the rest of the initiatives.” This is not correct, there are $0 allocated for the school of distinction in the 2019-20 budget. Projected costs would begin in the 20-21 projected budget, in additional to grants from external funders. I specifically asked about this in our workshop meeting. And, there are still many many issues to work through with all of these programs – both with the board and with broader stakeholder groups. Mr. Giandurco says “bold and costly plans are often met with resistance and controversy. This budget is no exception …The resistance stems from the past few years of disrespect from limited communication from Central Office.” I suggest the resistance comes from something entirely different – an endemic resistance to any change that has permeated the Norwalk schools for a long time (see NON’s analysis of that phenomenon here – https://www.nancyonnorwalk.com/2013/06/norwalk-schools-culture-seen-as-an-obstacle-to-growth). The frustration experienced by the union nowadays is that the Board and the administration have rejected comfortable (for employees) stasis in student achievement and moved – indeed boldly – to change things for the good of our students. The positive results are undeniable; see https://www.norwalkps.org/UserFiles/Servers/Server_71596/File/departments/Communications/State%20of%20the%20Schools.pdf. 1. Limiting or not giving a child any elective class because they need double interventions? So they get over 2 hours of math and language arts a day. 2. Limiting science and social studies to every other day and forcing the teachers to get a max load of 150 students between two grades is benefitting who? 3. Breaking apart effective teams at the middle schools where teachers could focus on the social and emotional well being of students. Versus now kids are just statistics to raise test scores again. 4. Implement a science curriculum that wasn’t even finished being written with a hap hazard roll out which has caused more confusion than anything across all grade levels. The teachers didn’t get their supplies until December for things they needed at the start of the year. 5. Moving teachers around to teach subjects they aren’t comfortable with is great for any student. 6. You say intrammurals cost to much, but yet you give someone a raise or bonus based on the work of the teachers? That makes a ton of sense. 7. If data is so important then why didn’t you notice that the first year you tried block scheduling 6th grade scores were the lowest in the district? Yet. It was the right thing to do for all grades the following year. 8. Morale is the lowest it has ever been with all of your staff. 9. You want students to compete globally, try actually teaching social studies in elementary school. Then they will know where things are in the world. Social studies has become the forgotten curriculum since it’s not tested thankfully. 10. We have created a culture of test anxiety. Kids do not need a salvo of tests to gauge where they struggle. If teachers were allowed to teach instead of being secretaries all day, they could give you better results than a pointless test. My final point. My daughter is a current 5th grader so I see all of these things going on. I have been a life long norwalker and it saddens me to see what our schools have become. School is not fun anymore. We have robotisized a great profession. Instead of asking the kids what did you learn today. Ask them what’s something fun and engaging you did. I can guarantee you wont get much. Many of Enough’s statements simply aren’t accurate, but I’m not going to do a point-by-point refutation. One thing I do need to address is the statement about us creating “a culture of test anxiety”. In fact, the current Board and administration have reduced the number of tests given to our students and replaced some of them with a growth-oriented (rather than high-stakes) approach to testing (see https://www.thehour.com/news/article/Norwalk-drops-13-educutional-assessments-9200482.php and https://www.thehour.com/norwalk/article/School-district-looks-to-improve-benchmarks-in-8096230.php. That there are bumps in the road, adjustments and difficulties in taking a moribund school district and reforming it shouldn’t be a surprise. Nor is it a surprise that folks who liked the easier (albeit less effective) approaches of the past lament them going away. We would be doing students a disservice if we kept doing things in 2019 the same way that we did them in 1980. Most of the complaints above don’t make a lot of sense if your focus is the students – we wouldn’t have gotten national recognition for our middle school reform efforts if Enough’s views were representative (see https://www.nancyonnorwalk.com/2017/03/incredible-results-cited-in-norwalk-middle-school-redesign/). Whether it’s the Invention Convention, Teach to One Math, schoolwide enrichment models, etc., we are implementing approaches new to Norwalk — but that have been successfully used for years in other districts — to keep students engaged and interested while learning what they need to be successful adults. We have excellent teachers throughout the district who are engaging today’s students and creating lifelong learners. And our schools’ students are the highest-achieving of those in any urban school district in the State – that’s nothing to be sad about! Thanks for your sales pitch. But you arent in the schools every day dealing with these “wonderful” strategies.